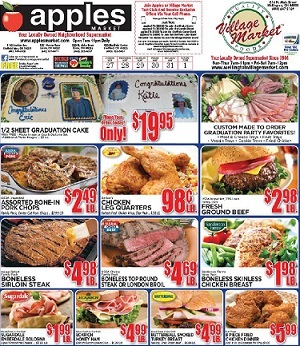 The latest Apples Market weekly ad circulars, coupons and specials. Every Apples Market store ad features hot deals and promotions on grocery products. Find the latest ad specials: Betty Crocker Brownie Mix; Keebler Pie Crusts; General Mills Lucky Charms; Quaker Cap’n Crunch Cereal; Bush’s Baked or Grillin’ Beans; Jell-o Pudding & Gelatin Mix; Wesson Cooking Oil; all Laundry Detergent; Frank’s Red Hot Sauce; Smucker’s Natural Fruit Spread; Country Crock Spread; Dannon Activia Yogurt; Digiorno or California Pizza Kitchen Pizza; Marie Callender’s Frozen Pies; Hillshire Farm Smoked Sausage or Kielbasa; Green Peppers; Portabella Mushrooms; Red or Green Seedless Grapes; Sweet Corn; Whole Seedless Watermelon; Canadian Lobster Tails; Velvet Ice Cream; Florida’s Natural Orange Juice; Hungry Jack Syrup; Nature’s Own 100% Whole Wheat Bread; Skippy Peanut Butter; Dawn Dish Detergent; Our Family Potato Chips; Our Family Taco Shells; Our Family Pineapple; and more. Apples Market stores activate their latest weekly ads every Tuesday. Apples Market has four stores located in Ohio: 230 North Abbe Road, Elyria; 1051 Meister Road, Lorain; 400 Sheffield Center, Sheffield; 4100 Ivanhoe Avenue, Sheffield Lake. The grocery stores offer weekly specials, and a convenient shopping experience that includes everything from meat, produce, breads, dairy, pasta and more.